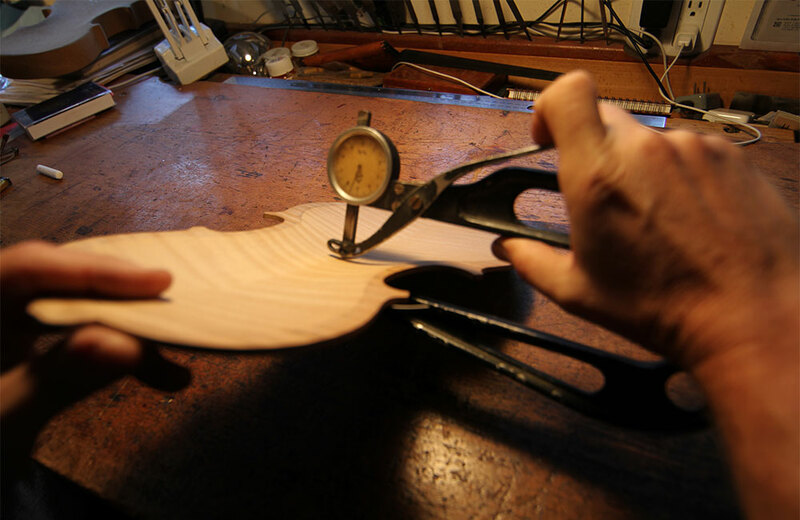 For the violinmaker, part of the challenge of making a great-sounding violin is determining the wood's proper thickness in varying areas of the instrument. The final thickness of the wood of violins has a major influence on the quality and character of its sound. As a violinmaker carves the top and back plates, attention to thickness is given, right down to the tenth of a millimeter. Along with the sound post, bass bar and bridge, the thickness of the wood of the violin top (or face) strongly correlates to the instrument’s sound. Depending on its size and thickness, wood is aged through a drying and seasoning time of usually well over ten years, and sometimes longer than half a century. Varying wood specimens bring considerable range of sound quality despite similar thicknesses and homogenous wood grain appearances. The top plate of the instrument is usually graduated to about 2.5mm except in the area around the sound post, which is usually thicker. The back’s thickness is shaped differently: thicker towards the middle and thinner at the edges, kind of like a speaker, creating momentum and movement across the entire plate starting at the heavy center. Several systems are used to determine the optimal thickness distribution on the instrument. Using a graduation caliper, the thickness of the plate can be measured at many locations while tapping, flexing or sonically vibrating resonance frequencies on the plates. Along the grain of spruce, the speed of sound of the longitudinal waves ranges between 4800 milliseconds and 6200 m/s. Densities range from 320 kilograms per cubic meter to 420 kg/m3. The quotient of these two amounts can serve as a measure of quality. Chladni patterns, measuring sonic vibrations by watching for the shapes of nodes as certain tonal modes are played, also help to indicate whether and where the shape and thickness of the top plate of the violins needs adjusting.